The medlar is an ancient fruit native to Iran and there are records of it’s cultivation since the 2nd Century BC, being grown by ancient Greeks and Romans. 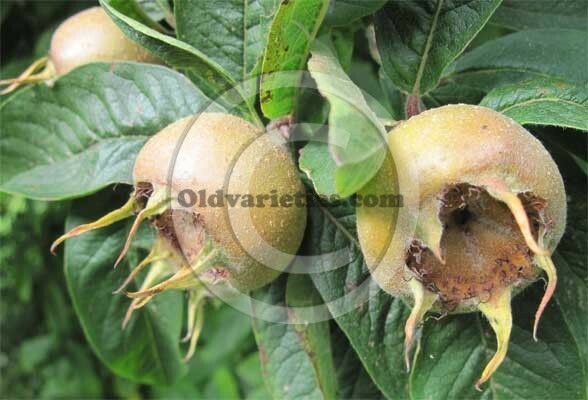 Medlars were very popular during the Victorian era. The large shrubs or small trees growing up to 8 m tall is deciduous. The dark green, elliptical leaves are about six to fifteen centimetres long and three to four centimetres wide. They turn a spectacular red in autumn before falling. The five-petalled white flowers are produced in late spring, they are hermaphrodite and pollinated by bees. The matte brown fruit is a pome, two to three centimetres in diameter, with wide-spreading persistent sepals giving a “hollow” appearance. It’s popular slang name is “Dog’s Bottom”. Medlar fruit are very hard and acidic, only becoming edible after being bletted (softened by frost), or naturally in storage given sufficient time. Once softening begins, the skin rapidly takes a wrinkled texture and turns dark brown, and the inside reduces to a consistency and flavour reminiscent of apple sauce. They can then be eaten raw, often consumed with cheese as a dessert, although they are also used to make medlar jelly and wine. Another dish is “medlar cheese”, which is similar to lemon curd, being made with the fruit pulp, eggs, and butter. Acorn Bank at Temple Sowerby in Cumbria is home to two very large Medlar trees. Medlar recipes on the Garden Organic website.